The United States has over 50 famous, well-traveled national parks. Among them are Grand Canyon, Yosemite, Yellowstone and Acadia. The country also has several roads called National Parkways. These long, winding paths let visitors experience nature, history and culture from a car. Like the parks, the roads are managed by the National Park Service. The parkways cut through some of the most scenic parts of the country. One of the longest – and most popular – is the Blue Ridge Parkway. National parkways are made up of scenic road and surrounding land. They were designed to give people driving cars a chance to see beautiful parts of the country. They also have been important for improving local economies. The idea for National Parkways began in the early 1930s, during the Great Depression. The Great Depression was a difficult economic time in the United States. Families and communities suffered. Many people were without work. A photo showing the site of the first construction on the Blue Ride Parkway. To create more jobs and improve the economy, the U.S. government built roads that passed through beautiful parts of the country that had suffered during the depression. One of these roads was the Blue Ridge Parkway. Leesa Brandon is Public Information Officer for the Blue Ridge Parkway. She said the early goal for the parkway was to build a road through the Appalachian Mountains that connected Shenandoah National Park with the Great Smokey Mountains National Park. 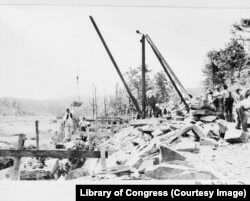 Work on the road began on September 11, 1935, in the state of North Carolina. The road was not officially completed until 1987. It is now 755 kilometers long, and runs from North Carolina to Virginia. In the beginning, building the parkway created some problems for local communities. People who had been living in the area were forced to move. Also, people were not permitted to drive vehicles on the parkway while carrying items for sale. Blue Ridge Parkway users enjoying food and beautiful scenery from the many viewpoints along the road. But, in the end, the Blue Ridge Parkway brought jobs and money to the communities. And today, it is an important part of the local economy. Brandon said the surrounding communities continue to depend on the tourism economy the parkway has created. In the last year, she said, the Blue Ridge Parkway earned over a billion dollars from tourism. That is more money than any other place managed by the National Park Service. In 2017, it was also the busiest of any National Park Service site, with more than 16 million visitors. The designers of the parkway were careful that road mixed with the environment in a natural way. The Blue Ridge Parkway was designed to mix in well with the surrounding moutains. “Every curve, every scenic vista is designed with so much intentionality,” Brandon said. Stanley Abbot, an architect, was the first designer of the parkway. He believed it was important to have variety in what people saw. Along with the mountains, Abbott wanted visitors to the parkway to see the valleys, forests, farms, rivers and homes of the surrounding communities. A hiker admires the view, as the parkway winds around mountains in the distance. 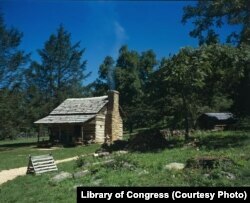 The parkway’s variety means visitors also can experience many different parts of the local Appalachian culture. Some stops offer a look at what life was like in the area during the late 1800s and early 1900s. The road passes by old homes and historic buildings. The 1890 single-crib log William Lawless Billy Ramsey cabin. Other stops introduce visitors to the music of the Blue Ridge area, as well as other traditional arts and crafts. The road also goes through part of the Cherokee Indian Reservation in North Carolina. The parkway connects people to the outdoors, too. There are over 900 kilometers of trails along the parkway. People can hike, bicycle and camp along the trails. 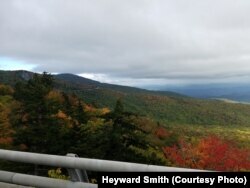 People driving along the Blue Ridge Parkway are treated to almost endless scenery of the Appalachian Mountains. 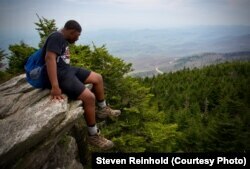 ​“Not everyone is willing to hike 30 or 15 miles [24 to 48 kilometer] in a day to get a great view. The parkway gives them the ability to get out, be in nature, enjoy a sunrise or sunset, either from their car or a short distance from their car,” Reinhold said. Reinhold says his favorite place on the Blue Ridge Parkway is Waterrock Knob, a mountain peak that stands over 1,800 meters tall. He likes it for its beautiful views and sunsets. 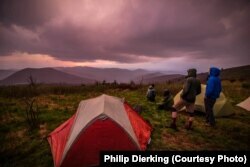 Hikers admiring a sunset from Black Balsam, a popular trail accessible directly from the Blue Ridge Parkway. Reinhold said he is thankful for the parkway because it ties together all the different communities. He added that it would probably be too politically and economically difficult to build such a road today. 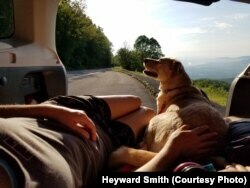 Knowing that helps him appreciate the Blue Ridge Parkway even more. “Now that we have it were all just in love with in and glad that it’s here,” he said. Phil Dierking wrote this story for VOA Learning English. Ashley Thompson was the editor. Do you have any National Parkways where you are from? Write to us in the Comments Section or on our Facebook page.